U.S. Sens. 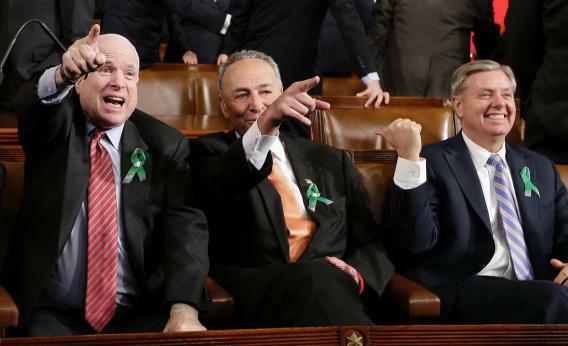 John McCain (R-AZ), Charles Schumer (D-NY), and Lindsey Graham (R-SC) sit at the annual State of the Union address on February 12, 2013 in Washington, DC. The 60-vote-threshold-for-anything standard is not new to the Senate. It took on weight in the Bush years; it has been perfected in the long war between Barack Obama and Mitch McConnell. But Republicans still struggle to explain why and what they’re willing to do to prevent votes on nominees, and the media struggles to briefly explain how they can stop it. Exhibit A: The Republican attempt to slow down the nomination. Josh Rogin, as usual, beat everyone by 24 hours to the story that two Republicans skittish about filibustering a SecDef nominee were waffling now. They are Lindsey Graham and John McCain, members of the ad hoc Filibuster Hagel Until We Get Benghazi Facts caucus. McCain has repeatedly said he is opposed to filibustering Hagel but told The Cable Tuesday that he would vote against a cloture vote this week if the White House doesn’t provide the information he has requested on the president’s actions the night of the Benghazi attack. Graham is also opposed to a “filibuster” of Hagel, but told The Cable today he would place a “hold” on the Hagel nomination after the committee vote. Both of them are inclined to let Hagel’s nomination get an up-or-down vote, but want to use this nomination as leverage. At a press conference this afternoon, asked whether he was “shifting the goalposts,” Graham basically said he was. McCain and Graham are alone for now. Hagel’s other critics, like James Inhofe, say they’ll filibuster him just because they want to stop him. Jennifer Rubin helpfully explains the timing of all this. If the cloture vote succeeds (60 “yes” votes), then there are 30 hours of additional debate. If the Senate goes into recess first, that time is not counted, but in all likelihood Reid would ram through the vote to put this behind the Democrats before the recess. Then a simple majority is needed to confirm. If there are 41 votes against cloture, Reid can either move on to something else or schedule another cloture vote. We know there are two Republicans committed to voting “aye” on Hagel. I’ve talked to Republicans skittish about filibustering. At various times, Susan Collins and Lisa Murkowski have sounded supportive of Hagel. And the White House is not treating Graham’s constant requests with great seriousness. (I was blown off when I asked about the last one.) There’s just no confidence that it can deliver anything to him that would stave off additional threats. So we go for the vote attempt.